Freiburg 2019: das aktuelle Projekt! 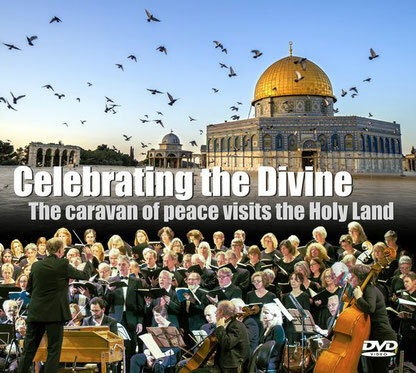 The British filmmaker Keith Surridge uses vibrant and moving images to create a tightly knit and moving mosaic which highlights the Caravan of Peace on its tour of the Holy Land. With his camera he accompanies the choir and orchestra on its 7 day concert tournée from Jerusalem via Bethlehem to Nazareth. A view from within which captures the unique atmosphere of this incredible journey. Staying close to the music with impressive sound recordings, close to the musicians with interviews about their feelings, close to the public and the religious representatives and above all very close to the very heart of the inspiration, which belies this astonishing journey. Throughout the film the conductor, Maarten van Leer, comments and explains the musical structure, intentions and emotions which lie at the very core of Johann Sebastian Bach’s masterpiece. the B Minor Mass. He also explains his motivation in instigating this fantastic concert tour with all the inevitable ups and downs and how the outcome turned into an astounding success. A film which reaches out, touches the soul and embodies the message of universal peace and mutual understanding. At the end of the premiere the enraptured public gave a standing ovation. By purchasing this DVD you will be directly supporting and aiding the organization Music for Peace and Mutual Understanding with its efforts to stage the next concert project. Musik für Frieden und Völkerverständigung e.V. In diesem Dokument erläutern wir, welche Daten von Vereinsmitgliedern und Spendern erhoben und wie sie verwendet werden. Vereinssatzung Musik für Frieden und Völkerverständigung e.V.